The standoff over the Tsagovsky Forest brings together protestors from across the political spectrum. For almost a month now, the Tsagovsky Forest in Zhukovsky, outside Moscow, has been known as “the second Khimki Forest,” referring to the scandal last year when an old-growth forest outside Moscow was threatened with destruction for the building of a highway to St. Petersburg. In Zhukovsky, 20 hectares of ancient pine trees are threatened by the construction of an access road towards the Gromov Flight Research Institute. The move has caused an uproar not only among local residents but also among the opposition in Moscow and the Nashi youth movement. The first major meeting between the champions of the forest and local officials took place at City Hall in early May. The federal forestry agency Rosleskhoz describes the clearing as “illegal” and demands that the “offenders be brought to justice.” Yet there is no sign that the felling will end; excavators continue to remove fertile topsoil from the site. At the meeting, the protesters were represented by Natalya Znamenskaya, editor of the Zhukovskiye Vesti newspaper, and city council deputies Lavrenty Lovitsky and Nikolai Kachnov. The authorities were represented by Deputy Mayor Stanislav Suknov, chief of urban development department Sergei Klepikov and the head of the city internal affairs department Oleg Mosyagin. The parties failed to find common ground. The defenders of the forest argued that the felling was illegal because the permit was not a proper one and there was no permit for earth works. The city administration said that some of the documents had already been posted on the site of the Moscow Region Main Road Management Directorate and pointed out that the activists “have not filed a single submission with a law court or the Prosecutor’s Office. On May 4, the city bused 50 representatives of the city’s utilities to the town’s main square to be addressed by Deputy Mayor Suknov. The defenders of the forest decided to take part as well. This was just the latest clash between the city authorities and the supporters of the forest. A month earlier, on April 7, more than 2,000 local residents and Muscovites turned out for a rally in the city center. They were addressed by Yevgenia Chirikova, one of the most well known defenders of the Khimki Forest. On the night of April 19, the activists’ camp on the felling site was visited by Ilya Ponomaryov, a State Duma deputy from the Just Russia party. “The more politicians and media people the better,” said Znamenskaya. Now the activists are looking for support from other important officials. Zhukovsky is a Russian aircraft building center and the need for the road has always been linked to the Flight Research Institute. Many of the activists work at the institute and they recently composed a draft letter to Deputy Prime Minister Dmitry Rogozin, who is in charge of the defense industry complex. The activists hope that the official, who has pledged to revive the Russian defense industry complex, will take the problem under his personal review. 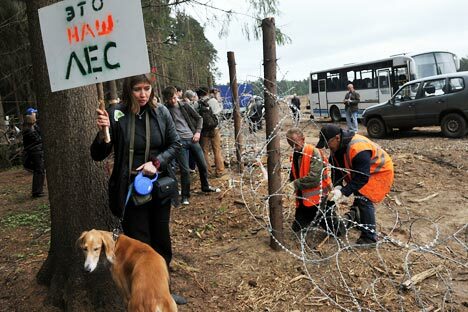 Rogozin is expected to come to Zhukovsky on May 18 and the forest defenders hope that he will sort out the issue. “However, if nothing happens after the visit, that would send the final signal that the authorities do not care about popular opinion and violations of the law,” said city council Deputy Lavrenty Lovitsky. First published in the Russky Reporter weekly magazine.